Have you ever wondered what the oldest breed of dog is? I recently wrote about ancient cat breeds and thought it would be interesting to do the same for dogs. I discovered that it may be hard to know which breed of dog truly is the oldest. The reason being is that dogs have been cross-bred so many times over the centuries. It's not accurate to label any modern breeds of dogs as ancient. Some may resemble ancient drawings or hieroglyphics, but truth be told they are probably much different today than their ancestors. Regardless, I still find it interesting to look back on our dog's ancestry and see which ones have been around for a long time. Did you know that dogs have been domesticated for 15,000 years? Amazing! But we've only been keeping them as pets for about 2,000 years. Prior to that dogs were primarily used to perform certain jobs or duties. I found a study here that identifies 14 ancient dog breeds. The dogs on the list were found to have the most similar genetic structures to those of wolves. All the breed information provided here can be found at the AKC's website. I've written a little bit about the Saluki in the past and here they are again. 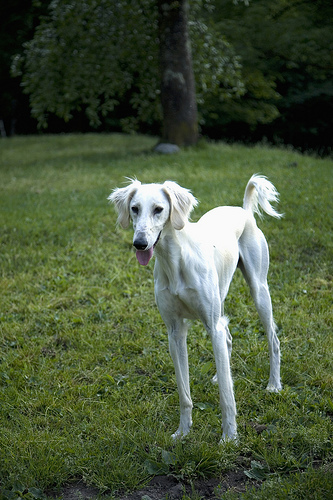 The Saluki is considered "the royal dog of Egypt". In ancient Egypt, their bodies were even sometimes mummified. That's just how highly the Egyptians thought of them. The Saluki is a sight hound and is very fast. They were strong hunters capable of taking down prey like gazelles. The Saluki is the royal dog of Egypt. The Chinese Shar-Pei is known for his super wrinkly skin. The Shar-Pei was used on Chinese farms and performed a multitude of tasks. Guarding, catching rodents, herding, and tracking were all some of the skills that these dogs used back in ancient times. Apparently, the Chinese believed that these dogs would protect them from evil spirits. Today, they are characterized by being intelligent but often stubborn. 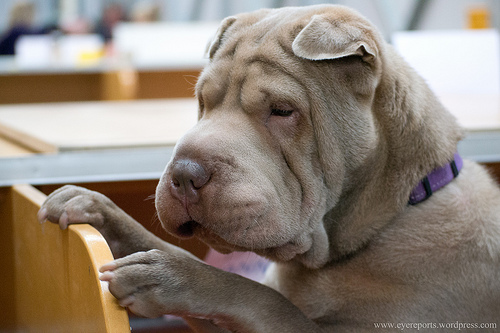 The Chinese Shar-Pei was believed to protect from evil spirits. 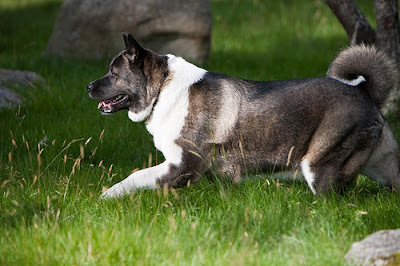 I've met a few Akitas in the past and I just have to say that they are huge! The breed originated from Japan which I didn't know until I started to research them. These dogs would track down animals like wild boar, deer, and even bears! They were also used as guard dogs in ancient times. The Akita was used to hunt bears. 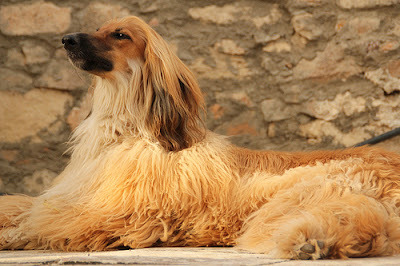 The Afghan Hound originated in Afghanistan and the surrounding areas. They are sight hounds and keen hunters. They typically hunted rabbits and gazelles during ancient times. Afghan Hounds are now known for their long silky coats. Afghan hounds hunt by sight. 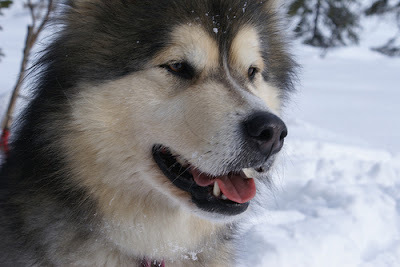 Alaskan Malamutes were bred for endurance. They were designed to be able to carry large and heavy things for long distances. They have lots of stamina. They are the largest and oldest of the Arcitic sled dogs. They are named after a native Innuit tribe - Mahlemuts. You'll notice that some of their cousins are also included on this list of ancient dog breeds. Alaskan Malamutes are larger than their cousins - the Siberian Husky. The Chow Chow is a breed of dog that comes from China. 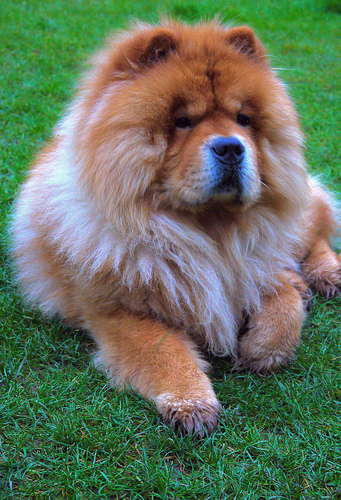 In ancient times, Chow Chows were used for a number of tasks including hunting, herding, pulling, and protection. They made excellent guard dogs during ancient times. Chow Chows are known for their black pigmented tongues. I wonder is this breed was one of the first dogs considered by people as a "pet". 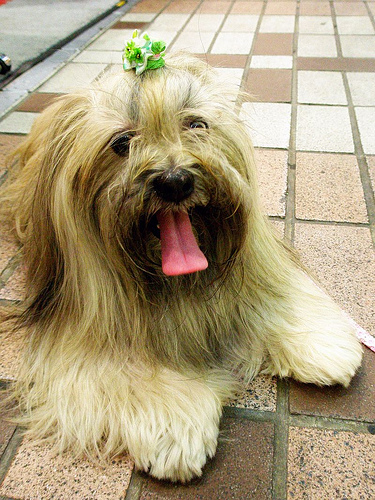 The Lhasa Apso comes from the Himalayan Mountains where it's very cold. I guess that's why they have such nice long coats. They were used as guard dogs for Buddhist monasteries and in the homes of important Tibetan nobles. The Lhasa Apso guarded Tibetan nobles. These dogs may also have been considered more as pets than workers it seems. 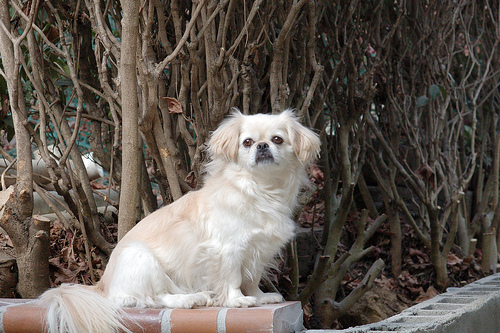 The Pekingese have a pretty interesting story behind them. Apparently, Pekingese was only allowed to be owned by royalty. If anyone tried to steal one of these royal dogs, the penalty was death! Only royalty were allowed to own Pekingese dogs. 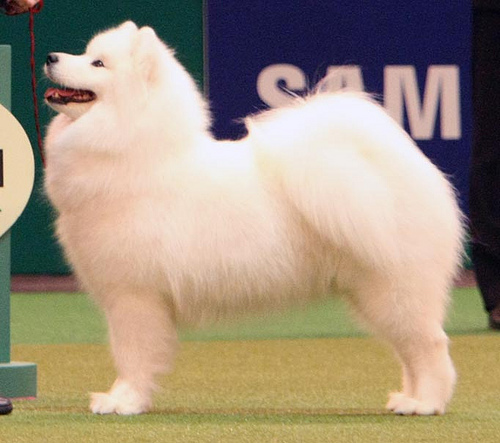 The Samoyed was used for lots of different jobs during ancient times. The breed comes from Siberia where it was very cold. Hence the thick coat. The Samoyed breed was used as a reindeer herder, a hunter, sled puller, and a guard dog. They were highly valued dogs. The Samoyed was a versatile breed. The word Shih-Tzu means lion in Chinese. This breed was another treasured companion by the Chinese. They didn't really have any working duties. Today, they are considered one of the most popular pets in America! 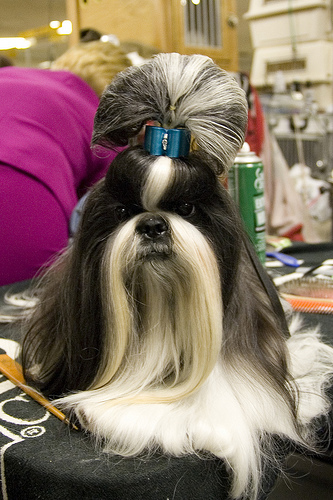 The Shih Tzu is one of the most popular breeds of dog in America. The Siberian Husky is thought to have originated on the Siberian peninsula where it's very cold. They have very thick double coats. In ancient times, they were used as sled dogs. 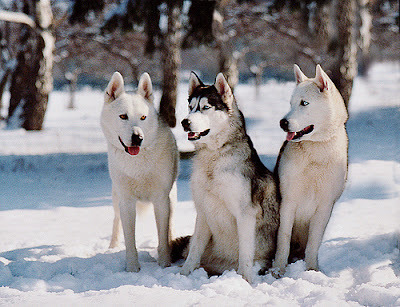 Siberian Huskies were used as sled dogs. These dogs are characterized by having fur that falls over their eyes. Well, there's actually a good reason for that! The hair that covers their eyes is a means of protection from the cold climate and elements of Tibet - the country that they originated in. Tibetan Terriers are not considered true terriers. They were considered the "Holy Dogs of Tibet" because they were raised by lamas in monasteries. They were mostly used for companionship and thought of as good luck charms by the lamas, but they also did some herding and retrieving. 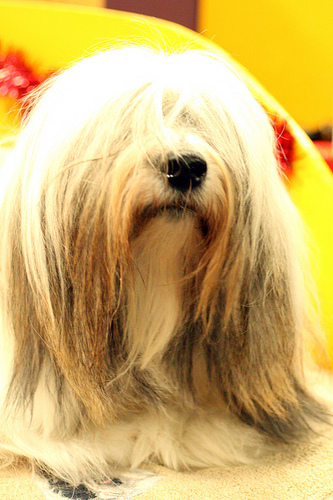 The Tibetan Terrier has locks of hair over its eyes to protect them from the elements. I know the Basenji as the breed that doesn't bark. Prior to my research, I didn't know much else about them. Turns out that the Basenji breed is a dog that comes from Africa. In Africa, they were used as pointers, retrievers, and they aided hunters by directing their game into nets. They were brought to Pharoahs of ancient Egypt as presents. 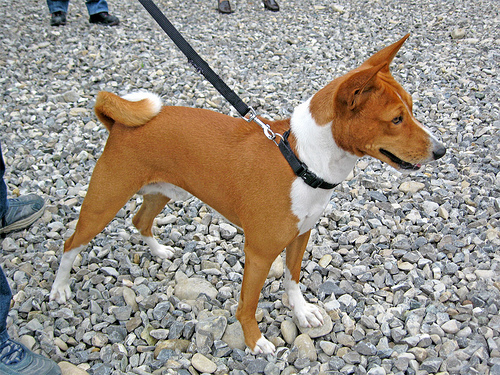 The Basenji is originally from Central Africa. The Shiba Inu personally reminds me of little cute foxes. This breed comes from Japan where it was used commonly as a hunting dog. They were bred to hunt in the heavy brush of the mountains. Their game included small animals, boar, and bear. I'm so surprised to see bear on the list - amazing! These dogs are pretty small, so it's hard to imagine them hunting bears. 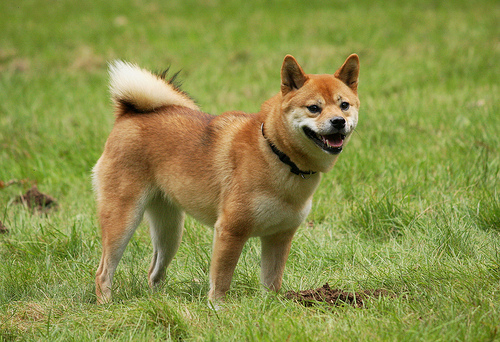 The Shiba Inu was used to hunt in ancient Japan. Cool post and I learned a lot. I've been reading headlines about native American dogs originating from China in the last week but haven't read any of the actual articles. It's interesting to see that some of the oldest breeds originate in Asian countries. I thought the Basenji originated in Asia but interesting to learn they're African dogs. I also thought that the Basenji was from Asia for some reason. I think maybe it's because they kind of look like a Shiba Inu to me. the breeding of many of the ancient breeds were kept for thousand of years. the chinese did this with their dogs and with their people. Great article. I have a friend with Basenji dogs, so knew they were from Africa. However, did not know the Samoyed origins. Very interesting. It is nice to learn about older breeds. I just used the list of dogs that were found to be the oldest by DNA research in a study. Thanks for the info! I recently read "Dogs: A Startling New Understanding of Canine Origin, Behavior, and Evolution" and was surprised by the authors' ideas and research about dog origins. So very interesting! Hmmm that sounds pretty interesting. That really was a wonderul post and I learned a lot too! Oh that was interesting!!! Thanks - I had no clue - I always thought the german shepherd is the ancestor of all breeds. Have agreat thursday! Actually,the German Shepherd is one of the newest breeds. It has only existed for just 110 years. Hmmm I didn't know that either! 1200 BC is pretty old still. I probably would have never guessed it either. Elizabeth said what I was going to say! When I saw the post title I wondered if cardis would make the cut but there are some really ancient breeds out there. Very cool! If it's okay, though, when people insist that Brychwyn is a mix or a designer breed, I am still going to retort that cardis are one of the oldest breeds. Very interesting, Miss Ann. I wonder who is the ancestor of us little terriers?!? Oh goodness Oz - I don't know! Great post ! thanks for sharing these informations with us. enjoy yur day...grate post ! Very informative--it's fun to learn the history of other breeds! I'm one of those newby breeds bred for herding. My Kelpie origins are from a black and tan collie taken to Australia around 1870. And my Border Collie side had origins about the same time. You know, I've heard you say you're a Kelpie before but honestly I've never heard of one before... I might have to look them up! Not all bears are huge. Some are smaller. This is very cool! I've done breed of the week posts on several of these dogs. They're all pretty amazing. What fun! Yea I guess you're right. I need to look up that bear and see how big it is. Plus, I don't think the dogs actually attacked the bear but just cornered it. Wow, that is such a good post. Lots of great pictures and tons of good info about the different breeds. It is fun to learn about it all. Take care. That is really interesting. We had never heard of a Basenji before. Nice post Ann. Have a tremendous Thursday. I had really enjoyed your cat ancestry article, Ann, and this one was very interesting too. I think the Saluki and Basenji are the ones that make me think most of ancient dogs when I look at them. Very interesting, thank you for sharing this! I love the picture of the 3 huskies :-)I didn't realize just how big Akitas were until I met one in person...wow.....Rocco shrunk to the size of a toy breed standing beside him! They are all so cuuuute! This was extremely interesting. I always enjoy learning more about the different dog breeds and their origins. I was inspired to do a little research and was able to find some information on Chihuahuas -- which appear to date back to the ancient Toltecs. Lots of information on their relationship to the Techichi. Thanks for posting this! Thanks PB! I am actually surprised that there weren't in Mexican or Central American dog breeds listed in the study. A couple come to mind when I think about it. I never knew that about Chihuahuas though! Very cool! Very interesting. I guess these all make sense since those areas are where some of the oldest civilizations come from. Yea, that's what I was thinking too. Except for there aren't any from Central or South America. I'm partial to the Malamutes and Sibes, but would someday love to own an Afghan Hound. When I was a kid, I was fascinated by Afghan Hounds. I think I always wanted one back then. Very interesting! One of our hiking friends is an Akita, but she can't hike with us in the summer because it's too hot for her. She likes the cold and snow. I think it's very nice of her parents to take that into consideration! Sculptures of a Hungarian Puli where found in the tomb of an ancient Princess dating back to 3900 BC. the Puli origins where also in Asia before migrating with the early Maygar People to present day Hungary, Clay tablets where found dating to 6000 BC also showing drawings of Puli walking with Shepherds and herds of cattle. Very interesting Adam - thanks for sharing. There are so many "old breeds" not listed here! great post, interesting and informative. i was surprised when i learn that most of the breeds today have not been around that long. I know! Isn't it amazing? Actually according to genetics the oldest dogs are the common pariah village dogs world wide. The malamute is a modern breed whose DNA is hardly related to the Eskimo dogs found in the archeological record in Alaska. Inuit is a Canadian term and not used here in Alaska. So the Mal has a lot of other dog breeds in its DNA other than Alaskan Eskimo dogs which are extinct. However the Alaskan interior village dog is very ancient - as is the Dingo and the Indog from India. These dogs are far older than any suggested here. I actually own 2 Turkish Kangals. And yes - this breed is extremly old. It goes back more than 3000 BC and I think they would be one of the oldest breeds around. It is an amazing experience to live with dogs that go back to babylonian times and I'm so grateful to be able to have them near me. (on this site it is mentioned, that Kangals are not meant to live in the house. Sorry, but that is bullshPEEEEEEP!!! Come evenig there is a good 100kg of dog that want nothing else but to cuddle up with the 5"2inch me and try to get comfy on my lap. They won't be happy by only living inside, but they NEED their family contact and a good portion of cuddles! And last but not least I want to apologize to everybody that had a hard time reading this. I'm from Germany (I'm half German and half Turkish) and my English is obviously not the best. Sorry. Hi Suheyla, Thanks for your input! I know that there are so many "ancient" breeds not included here. And we may never know the true answer to this question. I am not too familiar with the Kangal personally. I have to agree, however, that ANY breed of dog deserves a loving home inside no matter how big they are!! I hate to burst anyone's bubble, but...the oldest living breeds of dogs are the primitive wild dogs; the dingo and New Guinea Singing Dog. Their DNA is closer to the wolf than any domestic breed. The domestic dog did not come from the wolf. They came from wild dogs. Wolves do NOT domesticate and would've been far too big and difficult for prehistoric humans to handle. Thanks for sharing Steve! I think this list is mostly just talking about modern breeds of domestic dogs that have been around for a long time. Wolves are definitely not the same as domestic dogs. Thank you for your information. Some breeds I've never heard before.